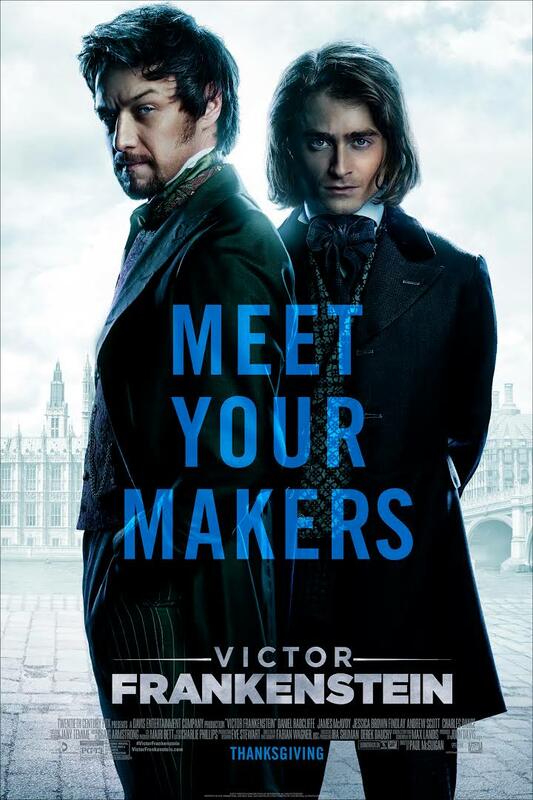 VICTOR FRANKENSTEIN OPENS IN MALAYSIA ON THE 26th OF NOVEMBER TO FIND OUT WHEN IT OPENS NEAR YOU CLICK HERE. You’d think that there would be tons of films about the famous monster created by author Mary Wallstonecraft Shelley who’s book came out in 1818, although in the first pressing her name wasn’t there as the author of the story. It was only in 1823 when the second edition of the book was published in France di her name appear as the author. Like I was saying before you’d think that there would be lots films about Frankenstein and you’d be right but most would concentrate on the monster not the creator and it would most definitely not feature the famous assistant Igor in the story. 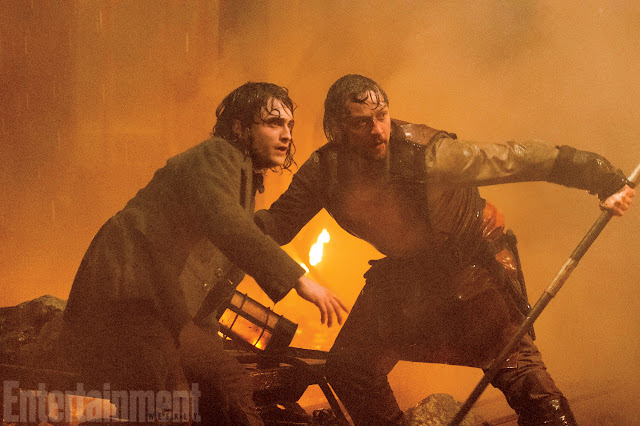 The last ‘Frankenstein’ movie to hit the big screen was last years I, Frankenstein and although that one did take quite a few things from the book in terms of characters and a little of the storyline it went in a completely different direction turning Frankenstein into a superhero character that hunts demons. The one that is considered the closest thing to the book is by Director Kenneth Branagh and featuring Robert De Niro as the monster Frankenstein. This new one directed by Paul McGuigan and written by Max Landis has all the tropes of the franchise except that the focus isn’t on the monster but the two characters that bring the monster to life. 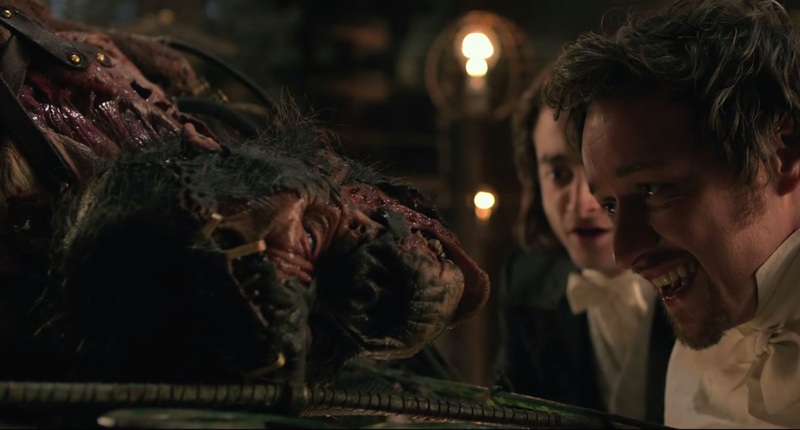 The film is told from the perspective of Igor who wasn’t always the faithful assistant to Victor Frankenstein, in fact in this film Igor only received his name after being rescued by Victor from a life of demeaning abuse by the owner of the circus he works in. He had no name. It was after being rescued by Victor that he was bestowed the name Igor Straussman by Victor. The name being taken from a delinquent roommate that Victor once had. Why did Victor rescue this nameless humpbacked clown? Because when a trapeze artist falls and breaks her clavicle and has trouble breathing the nameless humpback does something that surprises him, he saves her. He sees a spark of untapped genius in the humpback. So Victor saves him from the circus, cleans him, clothes him and opens his home to him and bestows upon the humpback a name. He also cures him of his physical maladies. With a new name and new posture as well as a whole now persona and confidence Victor begins to introduce Igor to his research and slowly piece by piece enlist his new assistants’ intellect in creating his first test subject. Upon seeing the completed test subject Igor is at first hesitant and fearful of it and what it entails but that doesn’t last very long. Victor’s enthusiasm quickly wins him over. Buoyed by his success he takes it to his college to show his experiment off to his peers but most leave in disgust except for one who intrigued by what Victor has done decides to finance the next stage of his experiment. His only requirement being that the next test subject be a much bigger one. Did I enjoy Victor Frankenstein? Yes, yes I did. This was a thoroughly entertaining film with a very interesting take on the familiar story and characters and with brilliant performance by the two lead actors. Let’s begin with the story which is told from the perspective of Igor. A very interesting angle and an unexpected one. 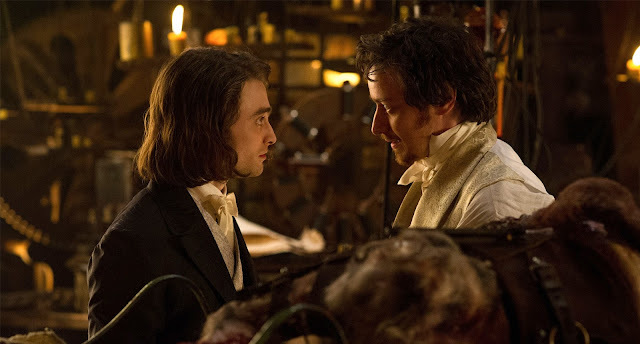 And of course it isn’t just about learning the origins of Igor that’s interesting but taking the character and turning him into an intelligent man the equal of Victor Frankenstein is truly interesting. Then there’s Victor Frankenstein himself. In this story you learn of Victor’s motivations for creating life out of nothing. The reason behind his maniacal obsession for going against nature. This is a story about the relationship between two men, one whose obsession borders on insanity and whose judgments are impaired by that obsession and the other conflicted by his sense of loyalty to his rescuer and the man who gave him a new life and a new confidence in himself. It’s also a story of morals, of science against nature, of science playing god. God represented by Detective Roderick of Scotland yard played by Andrew Scott who most recently appeared in Spectre (2015) as C the man who was secretly working for Spectre. All the themes I thought were handled very well with none being too heavy handed or technically to be understood quickly or having it confuse and/or muddle the story. The performances by James McAvoy and Daniel Radcliffe were brilliant as was that by Andrew Scott. Radcliffe’s interpretation of Igor was incredible and his acting from the physical to the facial was thoroughly entertaining. He stayed physically in character throughout exhibiting the slanted posture in every scene. Never letting us forget that he was once the slumped knuckle-dragging humpback that he once was. 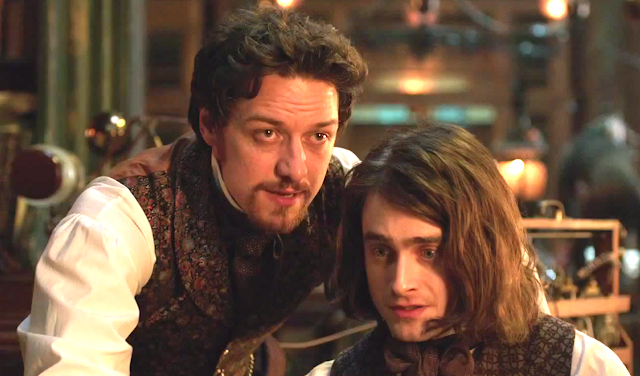 Then there’s the mesmerizing performance by McAvoy who was completely believable as the obsessed Victor Frankenstein. The crazed look in his eyes, his manic energy and passion for his subject of obsession clearly visible in every expression and every spit spraying line delivered. And then there’s the sombre Detective Roderick who clearly believes that Victor is doing experiments that are going against nature and god despite having little actual proof or evidence against Victor. His own suspicions of Victor an obsession that rivals Victor’s. Scott’s quiet intensity matching McAvoy’s manic and explosive performance. Visually this film for me looked incredible. The style and the scenes seemed to me to be lifted off the pages of a graphic novel. It was equally colourful and dark. The attention to detail was quite a joy to observe. And the composition of each scene at times looked like panes taken literally out of a graphic novel. I was actually surprised to find out that this film was not adapted from a graphic novel. The stylized look I think helped heighten the overall mood and impact of each scene in the film. Then there’s the monsters themselves of which there are two. Gordon the first test subject which was cobbled together out of different animals and of course the human monster which everyone knows as Frankenstein, although in this one it doesn’t have a name merely the project moniker Prometheus. Both looked incredible. Gordon disgusting and a clear violation of nature. Prometheus, impressive yet disturbing to look at. Victor Frankenstein had all of my attention and sitting at the edge of my seat. James McAvoy’s and Daniel Radcliffe’s performance had me so completely immersed in the story that my usual analytical brain took a break and let me just enjoy the ride. This is a well scripted story told very well with an amazing look with incredible performances by the lead cast. Whatever flaws it may have will only appear long after you’re done watching it I believe. I enjoyed it so much I’m going to give it a solid 4 out of 5. Well worth the price of admission and a film that shouldn’t be missed for fans of James McAvoy or Daniel Radcliffe who clearly looked like they were enjoying themselves on screen. Have a look at the trailer which I don’t think does the film justice actually which in this case is a very good thing. BIG THANKS TO CHURP CHURP AND 20TH CENTURY FOX MALAYSIA FOR THE CHURPREMIERE PASSES WHICH THIS TIME AROUND I WAS LUCKY ENOUGH TO RECEIVE VIP PASSES! AND THANK YOU TO GSC CINEMAS @ 1 UTAMA FOR HOSTING US ALL!